Option A considers a Light Rail Transit technology option for the Sheppard Avenue East Corridor. The route alignment provides 13km of rapid transit connecting the existing subway station at Don Mills to LRT running from Don Mills to Morningside. 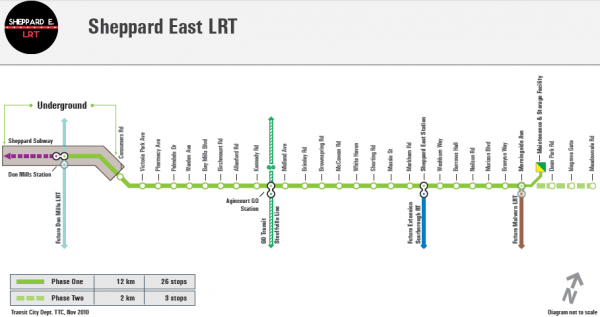 The proposed LRT line would provide 25 stops. Also, the Government of Canada, Province of Ontario and City of Toronto are bringing improved transit to North York and Scarborough. 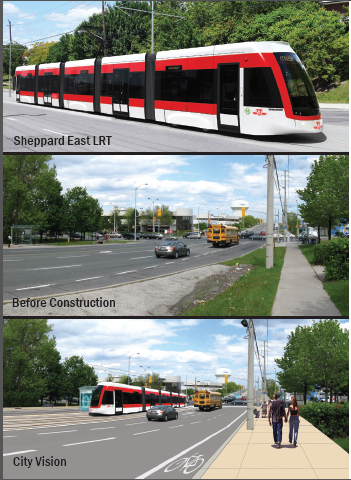 The Sheppard East LRT will be completed and service will begin in 2014. Above, Conceptualization of Sheppard Avenue East LRT. Metrolinx was created by the Government of Ontario in 2006, to address the urgent need to improve and integrate transportation in the metropolitan region stretching from Hamilton to Durham and north to Lake Simcoe. On May 14, 2009, GO Transit merged with Metrolinx – to build rapid transit projects faster and improve customer service for the traveller in the Greater Toronto and Hamilton Area (GTHA). In 2010, Province of Ontario had approved Metrolinx’s “5 in 10 plan”to build five transit projects in ten years. The 5 in 10 Plan proposes building the “Big Five” transit projects by 2020, while saving $4 billion in the first five years of the timeline that Metrolinx originally proposed. The Province of Ontario, through Metrolinx, has committed to investing $8.4 billion (2010 dollars) in rapid transit projects in the City of Toronto. As a provincially funded project, the transit option selected by the City for Sheppard Avenue East will also require the approval of the Province of Ontario. The Federal Government has committed $333 million to rapid transit expansion in Toronto under the Building Canada Fund. 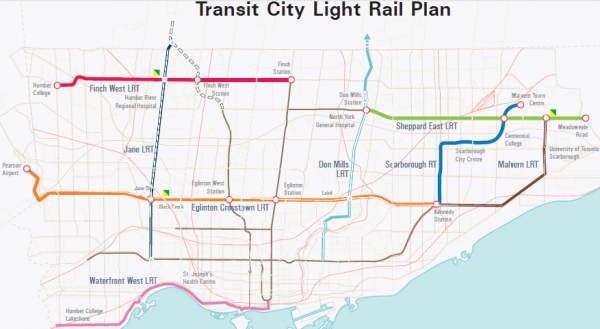 On February 8, 2012, Toronto City Council established an Expert Advisory Panel to assess options for rapid transit along the Sheppard Avenue East corridor. A Council decision on Sheppard Avenue East is required to complete Toronto’s input to the Province–which must decide on a timely basis on how best to fully commit available funds and implement construction across all transit expansion lines that were part of the 2010 Metrolinx plan. Confirm that Light Rail Transit(LRT) is the preferred rapid transit mode for Sheppard Avenue East, from Don Mills to Morningside, and confirm the Sheppard Avenue East LRT as a priority transit line within the approved Metrolinx ‘5 in 10 plan’. Request the City Manager to develop a communication plan which outlines the significance of transit’s role in city building, on Sheppard Avenue East and across the city. Request the province, through Metrolinx, to accelerate the preparation of the investment strategy for the “Big Move” transit expansion plan. A comprehensive public consultation process that provides residents and businesses an opportunity to participate and inform the development of a sustainable transit plan, including funding options, for the City of Toronto. An intergovernmental strategy in support of a sustainable transit plan; working with the Federal and Provincial governments (including P3 project delivery), along with appropriate municipal associations (e.g. Federation of Canadian Municipalities (FCM), to seek a commitment to the type of long-term tri-partite funding commitment discussed in this report. LRT is the most cost effective transit option presented. An analysis of the capital investment required for each option on a per rider basis, identified the Subway and Hybrid options to be significantly less cost effective than the LRT solution (see Table 17 in The ‘Report of the Expert Advisory Panel Regarding Transit on Sheppard Avenue East’). The cost per new rider is potentially two times higher under the subway option compared to LRT. The transit option must provide the necessary capacity to meet expected ridership demand in 2031. The investment of LRT in several neighbourhoods generates more new riders as opposed to a more costly investment in a subway for only Sheppard Avenue East. The LRT option will provide an opportunity to improve streetscaping along the corridor, improve pedestrian life and walkability of the neighbourhood. The LRT solution offers 24 station stops providing rapid transit access to key segments of the Sheppard Avenue East corridor that are currently underserved. Further, another key corridor of deep poverty that is not served under the subway option is Birchmount Road, which is provided a station stop under the LRT option. The Panel feels strongly that the LRT option provides greater access to residents who require and rely on transit the most, to access employment and other economic and social opportunities in the city and region. and frequency of stops which provide for improved pedestrian life along the corridor and improved safety for women (approximately 60% of TTC users) travelling by public transit. Provincial and federal governments have fully funded the cost of building the Sheppard East LRT line — along with surface LRTs on Eglinton and Finch Avenues. The LRT funds also cover the cost of storage and maintenance facilities for the line. However, the province has not committed any funds for the subway or hybrid options, both of which will increase the city’s debt levels. The funding plan must be aligned with Metrolinx’s investment strategy for the ‘Big Move’. City Council will consider the report and its recommendations during a special meeting Wednesday, March 21. Do you support or reject the Expert Advisory Panel’s recommendations? Please click here to read the full ‘Report of the Expert Advisory Panel Regarding Transit on Sheppard Avenue East’ , which contains the recommendations (pdf). The Expert Advisory Panel today released its recommendations for the future of rapid transit on Sheppard Avenue East. The report will be presented to City Council for consideration at a special Council meeting on March 21. The mandate of the Panel was to advise City Council on the most effective means of delivering rapid transit to the greatest number of riders along Sheppard Avenue East and to review existing and potential funding opportunities for transit along this corridor. There was strong consensus across the Panel that LRT was the best option available based on criteria that provided the greatest economic impact, best use of funding, transit service, sustainability and social impact. “The Panel was mindful that the choice must be broadly sustainable: it must meet today’s needs without compromising the ability of future generations to meet their needs; and it must meet Northern Scarborough’s needs without compromising the City’s ability to meet needs in other areas of Toronto,” said Professor Miller. Dr. Gordon Chong, CEO, Toronto Transit Infrastructure Ltd.
Ernie McCullough, Executive Director, Sheppard East Village BIA. Toronto is Canada’s largest city and sixth largest government, and home to a diverse population of about 2.7 million people. Toronto’s government is dedicated to delivering customer service excellence, creating a transparent and accountable government, reducing the size and cost of government and building a transportation city. For information on non-emergency City services and programs, Toronto residents, businesses and visitors can dial 311, 24 hours a day, 7 days a week. Professor Eric Miller is the inaugural Director of the University of Toronto Cities Centre. He has B.A.Sc. and M.A.Sc. degrees from the University of Toronto and a Ph.D. from M.I.T. Professor Miller has been a faculty member in the Department of Civil Engineering, University of Toronto since 1983, where he is currently a Professor and former Director of the University of Toronto Urban Transportation Research and Advancement Centre. Professor Miller is the Chair of the U.S. Transportation Research Board (TRB) Committee on Travel Behavior and Values and past-Chair of the International Association for Travel Behaviour Research. He has served as Acting Chair of the Department of Civil Engineering during 1998-99, 2003 and 2007. He was also the past-Chair of the TRB Sub-Committee on Integrated Transportation – Land Use Modeling and Member Emeritus of the TRB Transportation Demand Forecasting Committee and served on the TRB Task Force on Moving Activity-Based Approaches to Practice and the US National Academy of Sciences Committee for Determination of the State of the Practice in Metropolitan Area Travel Forecasting. Professor Miller recently chaired the travel demand modelling peer review panels for magnetic levitation demonstration projects in Pittsburgh, Baltimore and Las Vegas, has been a member of technical advisory groups for the TRANSIMS implementations in Portland, Oregon, Buffalo, N.Y. and Burlington, Vermont, and has served on numerous travel demand peer review assignments, including Los Angeles, Baltimore, Cincinnati, Salt Lake City (reviewing their UrbanSim application), Denver, Vancouver and Waterloo, Ontario, and, currently, the California High-Speed Rail Statewide Model. Professor Miller’s research interests include: integrated land use transportation modelling; analysis of the relationship between urban form and travel behaviour; modelling transportation system energy use and emissions; and microsimulation modelling. He is the developer of GTAModel, a “best practice” regional travel demand modeling system used by the City of Toronto, the Region of Durham, the Cities of Mississauga and Brampton to forecast travel demand in the Greater Toronto Area; TASHA, a state-of-the-art activity-based microsimulation model of GTA travel; and ILUTE, an integrated land use – travel demand models system for the GTA. Professor Miller’s international experience includes transit planning in Cairo, Egypt and developing a travel demand model in Mumbai and Hyderabad, India. He is co-author of the textbook Urban Transportation Planning: A Decision-Oriented Approach, the second edition of which was published in 2001.